1 Corinthians 1:17 (KJV): For Christ sent me not to baptize, but to preach the gospel: not with wisdom of words, lest the cross of Christ should be made of none effect. 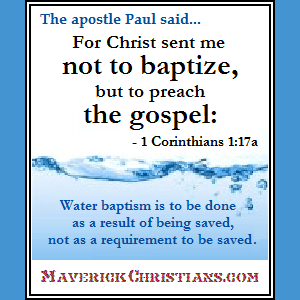 If water baptism was a requirement for salvation Christ would have sent Paul the apostle to baptize. However, Paul was not sent to water baptize but to preach the gospel of which water baptism is not an essential element. Romans 1:16-17 (KJV): For I am not ashamed of the gospel of Christ: for it is the power of God unto salvation to every one that believeth; to the Jew first, and also to the Greek. For therein is the righteousness of God revealed from faith to faith: as it is written, The just shall live by faith. Ephesians 2:8-9 (KJV): For by grace you have been saved through faith, and that not of yourselves; it is the gift of God, not of works, lest anyone should boast. Works, including that of water baptism, do not save. We are saved by grace through FAITH in Jesus Christ. John 3:3-7 (KJV): Jesus answered and said unto him, Verily, verily, I say unto thee, Except a man be born again, he cannot see the kingdom of God. Nicodemus saith unto him, How can a man be born when he is old? can he enter the second time into his mother’s womb, and be born? Jesus answered, Verily, verily, I say unto thee, Except a man be born of water and of the Spirit, he cannot enter into the kingdom of God. That which is born of the flesh is flesh; and that which is born of the Spirit is spirit. Marvel not that I said unto thee, Ye must be born again. The meaning of the words “born of water” is only understood within its own passage context. Being “born of water” refers to natural birth, as Jesus mentioned being “born of the flesh”. Water baptism was not spoken of here and was not the topic of discussion. Jesus was answering Nicodemus’ question “can he enter the second time into his mother’s womb, and be born?”. Natural birth is obviously the first birth as the first time we were born was not when we were water baptized. The Spiritual rebirth is being born again. To assert that water baptism is being born of water has theological difficulties. Christians do not experience three births: natural birth, water baptism and Spirit baptism. Christ said a man must be born again but He did not say we must be born again and again. Also, as seen from passages of Scripture elsewhere, Spirit and water baptisms are neither synonymous nor simultaneous. Belief in the completed work of Jesus Christ produces a clean conscience and saves (see Hebrews 9:8-14). Therefore, it is the faith in regard to baptism, not the water, that saves us. Acts 22:16 (KJV): And now why tarriest thou? arise, and be baptized, and wash away thy sins, calling on the name of the Lord. Three things are commanded here: 1. arise, 2. be baptized, 3. wash away thy sins, calling on the name of the Lord. Sins are washed away calling on the name of the Lord and not by water baptism. Acts 2:38 (KJV): Then Peter said unto them, Repent, and be baptized every one of you in the name of Jesus Christ for the remission of sins, and ye shall receive the gift of the Holy Ghost. We repent “for the remission of sins” to receive the forgiveness of sins. The blood of Jesus was shed for the forgiveness of sins to pay the price for our forgiveness. We are baptized because we have received remission, which is, the forgiveness of our sins. We do not need to be baptized TO BE forgiven of sins. We show our faith in Jesus by being water baptized. God forgives us when we repent of our sins before we are water baptized. God does NOT withhold his forgiveness until we are baptized. In the Scriptures, there are many works that are not requirements for salvation which have been mentioned together with the preaching of the gospel. Water baptism is one of many of such works. 1 Corinthians 12:13 (KJV): For by one Spirit are we all baptized into one body, whether we be Jews or Gentiles, whether we be bond or free; and have been all made to drink into one Spirit. Romans 6:3-4 (KJV): Know ye not, that so many of us as were baptized into Jesus Christ were baptized into his death? Therefore we are buried with him by baptism into death: that like as Christ was raised up from the dead by the glory of the Father, even so we also should walk in newness of life. Galatians 3:27 (KJV): For as many of you as have been baptized into Christ have put on Christ. All of these passages refer to SPIRIT baptism, not water baptism. Mark 16:16 (KJV): He that believeth and is baptized shall be saved; but he that believeth not shall be damned. We are not damned for not being water baptized. Unbelievers are damned. Those who are saved are water baptized consequential to their belief in Jesus Christ. Acts 10:47-48 (KJV): Can any man forbid water, that these should not be baptized, which have received the Holy Ghost as well as we? And he commanded them to be baptized in the name of the Lord. Then prayed they him to tarry certain days. In this passage is seen that the Holy Spirit is given to believers BEFORE water baptism. Hence, water baptism is a resulting act of obedience from faith. It cannot be a salvation requirement. Put your complete trusting faith in Jesus Christ to save you from your sins. After you believe in Him with all your heart, be water baptized as a testimony that you do put your complete trust in Him. and The truth about baptism.